Stay mobile on the battlefield by protecting your legs like the assets they are! The Steel Balthasar Full Leg Guards cover a generous portion of your upper thigh, knee, and part of the lower leg with steel plate armour. The leg armour is crafted from eight individual pieces in order to provide the most complete maneuverability possible. Bending your knees will be no problem at all. 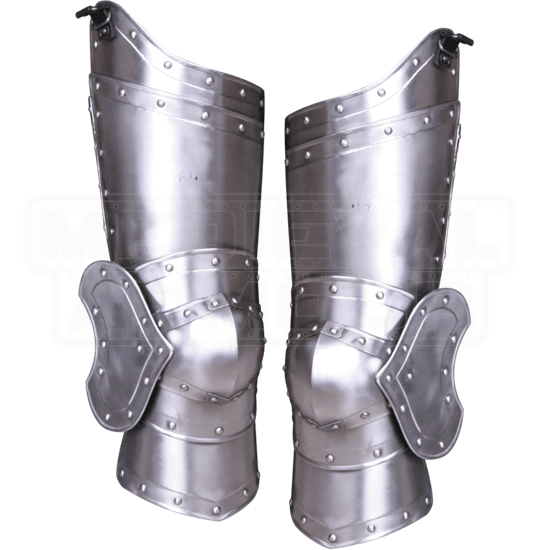 Showing off a shiny metal finish, these steel leg guards feature riveted and corrugated detailing for a look that perfectly suits medieval knights and champions of all kinds. It's also easy to wear, featuring a strap at the top that fits a belt, to better support the armor's weight. Combine this leg protection with other pieces of our Balthasar armour to create a complete LARP ensemble! Please be aware that this armour is handmade, and it can be thicker than listed here. As such, it is intended mainly for costuming, light reenactment, and LARP.